It may be time to revisit NASCAR’s new Camping World Truck Series pit stop policy. The procedure was implemented in an attempt to save teams money by reducing the number of over-the-wall crewmembers from seven to five, and prohibiting refueling and tire changes during a single pit stop. Unfortunately, the rule appears to have made no difference in the total number of over-the-wall crewmen utilized by most teams, while having an adverse effect on the competitiveness of the series. Last weekend’s race at Auto Club Speedway was one of the dullest in recent memory. Not all the blame can be placed on the new pit rules, since the Fontana oval has never ranked high on NASCAR’s list of most competitive venues. However, when the final 53 laps ran caution-free Saturday, teams were forced to run the final quarter of the race on worn out tires, negating any real possibility for side-by-side racing. Fellow series champion Todd Bodine said he was unable to run flat-out at the finish, due to his team’s inability to change badly worn tires. “The tires got hot, and I started pushing. I had a little vibration and wasn't going to take the chance." Series veteran Rick Crawford told Sirius Speedway Wednesday that the new pit procedure has not saved his team any money, since NASCAR had already mandated a reduction in the total number of traveling crewmembers; from 14 to 12. Crawford questioned the wisdom of doubling the number of pit stops, calling it a potential safety hazard for drivers, crewmen and corner workers. The next two stops on the Camping World Truck Series schedule are at Atlanta and Martinsville; two tracks that are notoriously tough on tires. Atlanta is generally marked by long periods of uninterrupted green-flag racing, while Martinsville features one of the tightest pit roads in all of NASCAR. With an off-week to examine the early results, here's hoping that NASCAR will reconsider its new pitstop procedure and put the spark back into what is arguably the sanctioning body's most competitive division. 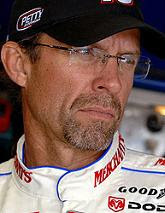 Kyle Petty Upset With RPM's "Chicken Crap Diplomacy"
Kyle Petty said yesterday that he is unhappy that Richard Petty Motorsports failed to inform him before running a retro-paint scheme commemorating his first career victory on AJ Allmendinger’s Valvoline Dodge in the Daytona 500. Petty told reporters last week that he was "crushed” by the move, adding, “I was hurt and I'm not going to get over it for a while. That was my paint job and my car and my number and my stuff from my first win. Not for Petty Enterprises or GEM or whoever that is." Petty phoned Sirius NASCAR Radio’s Sirius Speedway yesterday to clarify his comments, and also address what some see as a rift between himself and his legendary father’s new race team. Petty repeated earlier comments about the 2008 sale of Petty Enterprises to Boston Ventures, saying he feels his family team ceased to exist when Boston Ventures came aboard and moved the team from its longtime home in Level Cross, NC. He also conceded that at some point, all parties will have to agree to disagree, and move on. “Definitely,” said Petty. 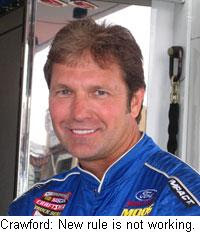 “I was at a press conference announcing a golf tournament for the Victory Junction Gang Camp, and the question was, `Were you invited to the press conference, or made aware that they were running a retro paint scheme?’ The answer to that was, `no,’ and when they asked how I felt about it, I said, ‘crushed.’ I don’t care about getting an invitation, I just wanted a heads-up on it. When I came to Daytona, I got blindsided by it. “If the Chicago Bulls are having a Reunion Tour and they don’t invite Michael Jordan, that’s their fault," said Petty. "If they don’t want to (include him), that’s their deal. But I’m sure they would give him a heads-up and say, `This is what we’re going to do, we’re just not going to include you.’"
Petty also insisted that there is no rift between himself and his father, saying he had answered a very specific question, and that his answer had been taken out of context. “I sat and talked (to the media) for an hour and a half, and they wrote a 25-word story,” he said. “It never comes across right. That’s not the writer’s fault or the editor’s fault, it just happens. Sometimes things get taken out of context and lead (people) in a different direction. "This whole issue revolved around one single car, one single press conference and one single heads-up. I didn’t get that, and I was teed off about it. That’s as simple as it was." If ignorance is indeed bliss, Orlando Sentinel sportswriter David Whitley is surely the happiest man in America. In today's Sentinel, Whitley has penned a commentary entitled, "NASCAR Drivers Don't Qualify As Being Athletes." In it, he equates NASCAR racers to short-order cooks at your local Waffle House, whose primary skill is being able to block out distractions and concentrate in a hot environment. "(NASCAR) drivers are athletes...only if you think it's athletic to make a Grilled Texas Bacon Double Patty Melt Plate," he wrote. "Preparing it requires stamina, strength, concentration and guts. Sounds a lot like driving, no?" "I admire any professional driver," said Whitley. "But if that skill set makes him or her an athlete, so are these people: Poker players. Transplant surgeons. New York City taxi drivers. Hairdressers." It must have been a slow news day at the Sentinel today. Either that, or Mr. Whitley thought he'd gain a little national attention by putting his ignorance and arrogance on public display. Most people aren't so anxious to display their stupidity, but Whitley apparently has no problem with it. Feel free to read David Whitley's entire column HERE. Fair warning, though, it'll make your blood boil. If you'd care to share your thoughts with him, his e-mail address is dwhitley@orlandosentinel.com. 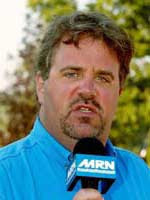 David Whitley will join us live on Sirius Speedway, Tuesday at 4 pm ET. We told you yesterday that it would happen, and it has. Bill Davis is now a minority owner of the newly renamed Penske Championship Racing, and Sam Hornish Jr. is a guaranteed starter in the Daytona 500. Davis sold his entire operation to Bill Held and Marty Gaunt recently, but apparently retained the 31st place owner points accumulated by his #22 Toyota and driver Dave Blaney a year ago. Those points now belong to Hornish and his #77 Dodge, guaranteeing that Hornish will be a part of the first five races of the season. A year ago, team owner Roger Penske handed Hornish the owner points accumulated by teammate Kurt Busch, guaranteed the former IndyCar star a spot in the 2008 Daytona 500 field. Interestingly, NASCAR spokesman Kerry Tharp said today that Hornish will not take part in Saturday night’s Budweiser Shootout at Daytona, despite the fact that his newly acquired owner points would make him sixth-best among all Dodge drivers. Tharp said NASCAR has already set the Bud Shootout field, with Richard Petty Motorsports driver AJ Allmendinger taking the spot that would have gone to Hornish. Hornish’s ascension to Guaranteed Starter status should bump 37th-place point man AJ Allmendinger onto the “Go Or Go Home” list, and with both Richard Childress Racing and Phoenix Racing seeking similar deals for Clint Bowyer and Brad Kesekowski, it appears that Marcos Ambrose may be joining him soon. NASCAR will announce its finalized Top-35 on Friday. It appears that the off-season scramble for Top-35 owner’s points is far from over. Sources tell Sirius Speedway that more owner point transfers will take place this week, as teams jockey to secure guaranteed starting spots in the Daytona 500 and starting berths in Saturday night’s Budweiser Shootout. Sources say that Richard Childress Racing (Clint Bowyer), Penske Racing (Sam Hornish, Jr.) and Phoenix Racing (Brad Keselowski) are all working to secure Top-35 owner points this week, a process that will further muddy an already incomprehensible situation. For the record, NASCAR does not allow the direct sale of owner points. However, the sanctioning body has historically allowed offseason point transfers, as long as the original team owner retains at least a token ownership stake. That’s where things get a little funky. Based on those guidelines, Bobby Ginn retains an ownership stake in Dale Earnhardt, Inc., after DEI assumed the owner points from Ginn’s #01 and #14 Chevrolets in July of 2007. Has anyone seen Bobby Ginn lately? Does anyone believe that Ginn’s ownership stake in DEI exists anywhere but on paper? The Ginn/DEI “partnership” is just one in a series of shadow alliances designed to exploit NASCAR’s owner point guidelines. And lately, there’s a new example every week. Paul Menard’s new #98 Ford will use owner points accumulated by Yates Racing teammate Travis Kvapil last season. Hall Of Fame Racing’s #96 team finished 39th in owner points last season, but new driver Bobby Labonte is a guaranteed starter for the Daytona 500, thanks to a hastily announced “technical alliance” with Yates Racing that gave Labonte the 2008 owner points from David Gilliland’s #38 Ford. JTG Daugherty Racing formed a similar alliance with Michael Waltrip Racing recently, allowing the new team to use owner points accumulated last season by Michael McDowell. Front Row Motorsports announced an alliance with DEI-Ganassi this week, making them a guaranteed Daytna 500 start, despite the fact that FRM ran only five races last season. It’s going to be interesting to watch the procedural manuevering in the next few days. Teresa Earnhardt and Chip Ganassi are now maxed-out under NASCAR’s four-team ownership limit, and would presumably be forbidden from entering into any further alliances. However, Sirius Speedway has learned that Phoenix Racing owner James Finch is working on a deal to lock Brad Keselowski’s Miccosukee Chevrolet into the Daytona 500. Penske Racing is reportedly in hot pursuit of the #22 team’s unused owner points for Hornish, after BDR’s new owners shuttered the racing portion of that operation. Richard Childress is also said to be searching for owner points to lock Clint Bowyer’s new #33 Chevy into the first five races of 2009. If there’s a way to get a deal done, they’ll find it. And in my opinion, it’s a darned shame. 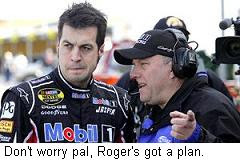 NASCAR’s Top-35 rule was established to reward team owners for their support of the NASCAR Sprint Cup Series. Based on those guidelines, Michael Waltrip has every right to shuffle owner points from David Reutimann’s #44 Toyota to his new #00 car. Richard Petty Motorsports is likewise entitled to swap points from its #10 Dodge to the new #44. Stewart-Haas Racing is justified in using last year’s owner points to benefit Tony Stewart and Ryan Newman. That’s what the rule was designed to do. It was absolutely not designed to lock teams into the Daytona 500 that did not even exist a year ago. 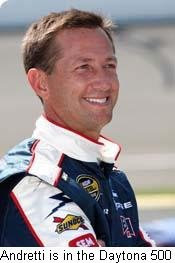 Front Row Motorsports and driver John Andretti will race in the Daytona 500 next Sunday, likely forcing Richard Petty Motorsports and AJ Allmendinger onto the “Go Or Go Home” list. Which team did more for NASCAR Sprint Cup racing last season, and which deserves to be rewarded? I am not criticizing Front Row Motorsports, or any of the other teams involved. They’re doing what they’re allowed to do, and with last place in the Daytona 500 worth a cool $260,000, I don’t blame them for exploiting a system that allows – and even encourages – exploitation. The problem is with the system itself. NASCAR’s owner point guidelines are like Dr. Frankenstein’s monster. They were designed with the purest of intentions, but have now gone terribly wrong, breaking free and running amok, terrorizing the countryside. Somehow, failed teams like the #22, 15, 01 and 41 have become hot properties, not for their parts, pieces and personell, but for the owner points that amassed before dying. Teams like Front Row Motorsports, Penske and RCR have been forced to become modern-day cradle robbers, looting the tomb of all valuables in the dead of night. Sadly, NASCAR now finds itself rewarding teams that have not earned that kind of preferential treatment, and penalizing teams that have.